Flip Acreage then Finance Smaller Lots because it is better for you. Jack Butala: Flip Acreage then Finance Smaller Lots. Every Single month we give away a property for free. It’s super simple to qualify. Two simple steps. Leave us your feedback for this podcast on iTunes and number two, get the free ebook at landacademy.com, you don’t even have to read it. Thanks for listening. J. Butala: Jack Butala with Jill DeWit. J. DeWit: Howdy. Happy Friday! J. Butala: Yeah, I was going to say the same thing! Welcome to the show. What a crazy week. 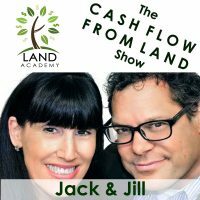 In this episode, Jill and I talk about flip acreage for the cash, and then finance the smaller deals out to establish that income stream. Cool show, man. This is a good little peep to our basic roadmap. Before we get to it, first lets take a question posted by one of our members on the LandAcademy.com online community- it’s free! J. Butala: Luke, Luke, Luke! J. DeWit: Luke, Luke, Luke! It sounds like we have 80 Lukes. J. Butala: We have two vocal Lukes for me. J. DeWit: Luke asked, “When pulling data, is there a difference between land that is labeled as vacant in county data, versus land that is 0% improvement value? If not, why not just select all the property types in 0% improvement value?” What a smart question! J. DeWit: I know who it is too! J. Butala: … the newer Luke. And that’s a great question, I’m going answer it in detail, probably to the point where Jill’s bored. J. DeWit: I have a magazine right here somewhere, hold on. J. Butala: So when you go to pull data out of RealQuest, which is part of our membership subscription, RealQuest Pro, he’s exactly right. I’m going to answer the first question, what is the difference between vacant property, that’s the use, so there’s uses of property- vacant property, single family residential, agriculture, heavy industrial, cemetery, hospital, there’s tons of zoning/use types in any given county. So he’s asking what’s the deal? Why I just pick all the vacant property that … he’s asking vacant county data versus land with a percentage on it. So the second part of this is that zero improvement value means this: there’s no assessed value for any improvement on the property. This could be in the middle of town, right in the smack middle of an urban area, there could a completely unimproved property and the improvement value is zero. Doesn’t have to be a structure, improvement value could mean the sewers are hooked up to it, or there’s a slab on it for a mobile, that’s improvement value and it’s going to be assessed that way if the assessor finds out about it. Which is, by the way, why you have to pull permits. That’s the reason the county really wants to pull permits, one of the main reasons is so they tax it properly. So, why not just say all types with with zero improvement value? You can, and some people do. You’re going to send a lot of mail out that you know people are just going to crumble up and throw away, and that’s the reason. You want to surgically strike, you want to spend the smallest amount of money on postage to get the greatest yield. And for us, I have a thing with industrial property, we never buy it. I never even send a letter to it. So I take all the industrial property out, I take all the cemeteries out, I take all the hospitals out, so that’s the reason. It might be zoned for healthcare facility, but have 0% value, you don’t send that person a letter. You’re just wasting 50 cents or whatever it costs, 48 cents. J. DeWit: I say, think about who your buyer is, that’s the real thing. Most of what we’re doing, we’re buying for someone who’s going to use it for a retirement, for cabin, it’s some kind of recreational use usually. Or full time living. So think about your buyer. Now, if you’re really out there buying for a hospital or an airport, all right, now we’re going to do some different things. But I think that’s what Jack’s trying to say. I’m thinking about the property use and I’m taking all the other stuff out. J. Butala: Exactly. So the flipside of that too is that you don’t want to just select vacant. I’ve seen people do this. This is a very typical mistake even for seasoned people, if you just say, “I’m only select vacant land with zero improvement value, because I really want to rush through this data script, because I don’t want to do this.” And I see this happen a lot. You’re missing probably 50%, maybe more, of the huge, huge opportunities that exist. J. DeWit: If I don’t select vacant, what good stuff is going to pop up if I don’t select it? J. Butala: Dream it up. Commercial mobile. J. Butala: You know, Jill, you and I have been saying this to each other all the way through- mobile home. Property that is designated as a mobile sells the minute we buy it. J. Butala: For retail value. People living in mobile homes, and this is my opinion, we’re going to get a lot of emails on this, get ready. People in mobile homes have a lot figured out in my mind in a real positive way. It’s extremely inexpensive. People who are buying three and four and five, eight hundred thousand dollar houses so that they can have a big mortgage and a huge yard- I question that. People who live in a mobile home and they’re paying a pad fee two or three hundred dollars a month, they can’t wait to move that mobile home or get another one and slap it on a piece of dirt that they own outright for five or six or ten grand, and never pay that pad fee again. J. Butala: And that’s why we can’t keep it there. I’ve even looked into recently buying a big piece of property and just designated it, not even doing improvements to it, but designate a bunch of them as mobile pads. We’ll see how that goes. J. DeWit: It’s a growing thing, too. Let’s talk real quick- the whole tiny house movement. If you watch those shows, in case you hadn’t noticed, there’s wheels on those things. They are buying these homes that are prebuilt, somewhere, and they’re hauling them somewhere and putting them on the property. And they’re all ready to go. They don’t even need to plug anything in. There’s solar, they have their water trucked in, some have collection things that they do on their own, it’s beautiful. So that’s a whole community of people, of your buyers that want these commercial properties, it has to be designated that way so they can put that kind of establishment there. It’s interesting, because early in my career I learned about that. I didn’t know- because I thought, “Well, so what? You own the property. What do you mean that I can’t just put a wheel-something up my RV and leave it there for a year?” No, you can’t. There’s a lot of counties and cities that have rules against site-built, slab-built, and all that kind of stuff. J. DeWit: Modular. They have rules against that. When you have that kind of property, it’s super exciting and valuable. Like Jack and I talk about, it’s easier to zone down than it is to zone up. So if you have commercial, you can usually go down to, I want to build a cabin and pour a slab. But if you have a cabin property and you want to make it an RV park, that’s going to be harder to do. J. Butala: Make no mistake, changing the zoning on anything up or down is a long-term endeavour. J. DeWit: It’s not a five minute phone call and you fill out a form, and write a check for 12 dollars. J. Butala: Somebody finds a county like that, that allows that still, please keep it to yourself because you’re about to retire. J. DeWit: But call us. J. Butala: Call me personally. J. Butala: I’ll help you. J. DeWit: There we go. J. Butala: That’s the whole deal, it’s such an important question. There’s just a lot of different property types that get overlooked, I think mostly due to laziness, honestly. Just because it says vacant, “Oh, that’s what I want! That’s what I do, vacant land.” No, no. There’s all kinds of type of property that you should be buying. And some that you should stay away from. Did I sufficiently bore you? J. DeWit: No, you did great! Now you’re perfect. J. Butala: Do you have a question or want to be on the show? Reach out to either one of us on SuccessPath.com. J. DeWit: Today’s topic is- can I jump in? J. DeWit: Flipping acreage. Yeah this will be fun. Flip acreage then finance the smaller lots. Great show, Jack will like this topic. Take it away! J. Butala: So here’s the deal. You’re going to send a bunch of mail out, right? And you’re going to send offers, and they’re all going to come back, lots of them are going to come back signed, a certain percentage anyway. Some are going to be 40 acres, 80 acres, 100 acres, 160. And some are going to be smaller, like, I don’t know, 1 acre with some type of attribute, let’s say north Michigan or a vacation spot, maybe it’s Florida. And you spend one or two or three thousand dollars for these vacation lots we’re going to call them. And you spend about a hundred or two hundred dollars an acre for larger acreage properties. So if you’re buying an 80 acre property for eight grand, and you sell it, you double your money like our business model says, for 16. Now you got sixteen thousand bucks to play with. What do you do? You go spend a thousand dollars on sixteen properties and sell them in terms. So now you have sixteen separate income streams coming in, assuming you’re doing good at making good acquisition decisions, instead of just that one on that 80 acre property. So that’s what I mean by flip the acreage for cash, and then finance the smaller lots. The numbers are staggering. And we have multiple members who are just floored by this whole concept. I wasn’t super clear about it when we started the company a few years ago, a couple years ago, because it just made so much sense to me in my silly accounting way of thinking. J. DeWit: It’s not silly. J. Butala: So, yeah, flip as much acreage as you can right at the beginning and amass a ton of money, and then go buy one, two, three acre properties that people are really going to use- they’re not just going to put a ranch up or something. J. DeWit: You know what I love about this in our online community? I don’t know if it’s … we have a member area, it’s like our pro area, and then we have a regular area, I don’t remember which, but we members who are sharing their numbers in here and I love that they do that. J. DeWit: They’ll put in there, I’ve got … because you can … they’re doing it exactly right. Every month they’re adding a property on terms, right? J. Butala: Working on Sunday. J. DeWit: Yeah. In two years you’ve got five grand coming in and you’re doing nothing. J. Butala: And in four years, you have ten. That’s the whole point. That’s the name of the program. In five years, if you do this way part time, and really just aren’t real vigilant about it, it turns out a lot of people are a lot more vigilant about it. J. DeWit: Oh gosh, they’re going crazy. J. Butala: You can do it fast. You can get cash in 45 days and be completely done within 50 months. I mean 60 months, in five years. You can completely done in five years. J. DeWit: And that’s really the best way to build up these payments. And then when you have so many, imagine you have 25 payments- if something happens and one falls off, big deal. J. Butala: Sell it again. J. DeWit: It’s not going to make or break the bank. J. Butala: We have some properties that go out, like … if I say the word “foreclosure”, we didn’t foreclose on it, people just stopped paying. We resell a property like that every month. J. Butala: We have tons. Tons of property. So do our members. J. DeWit: It’s great. The bigger ones, what you keep doing is you keep some money back, keep your acquisition funds healthy, so you can keep buying more. J. DeWit: Keep that coming in. It’s the best. J. Butala: In the beginning, what I say is, do two cash sales to every one term sale. And make sure the bigger cash deals are cash, and the smaller ones are terms. Because on a terms deal, you better … the highest quality property you have should theoretically be sold on terms. Somebody is going to drive their up there on the weekend with their family, pitch a tent, put an RV on it, have a blast, and use the property. So you want to make sure they can get to it, it’s not a massive … you want to do the right thing about it. J. DeWit: You know what I look at too sometimes? Sometimes I think about those, like, “I hope it does go sideways, because I want to spend some time on there!”. You know. Seriously. J. DeWit: We have a couple like that. J. Butala: … No sale property that we’ll never sell. Right out of a postcard property. J. DeWit: Gorgeous. We may never use it, but the option’s there. J. DeWit: It’s paid for. That’s the beauty of this too. If I ever needed cash, not that I ever do, but if I did I could just sell something. And that exact thing happened. But now, it’s his whole business. J. DeWit: Why would I stop? Now I’m a pro. J. Butala: … These are 150 thousand dollar lots that he was buying for 50 grand. J. Butala: 50 to 70 thousand, I think. J. DeWit: Isn’t it funny? That makes me crack up that people we don’t hear from them, because we know what’s going on. He’s going to pop up at some point when there’s something huge, big, astronomical and say, “Hey, do you guys want to do this with me?” Heck yeah. J. Butala: Jill and I are working on some really big ranch deals in California right now it’s- man, it’s amazing how much, it’s amazing to me how people are just done with their property. J. Butala: And they’re just waiting for the check, and it’s half of what it’s worth, sometimes less. J. Butala: Good content is coming your way. J. DeWit: And inspiration- that’s me. J. Butala: … to get just about anything you want. J. DeWit: We use it every day, even on Fridays, to by property for half of what its worth, and sell it immediately. J. Butala: You are not alone in your real estate ambition. We’ve got such cool stuff coming up. J. DeWit: I know, I can’t wait. J. Butala: So excited about this. J. DeWit: I know. Some of it- I don’t have a film guy follow us everywhere yet, but it’s coming. Because there’s going to be some really good stuff. I’m excited. J. DeWit: I hope … you’re right. Sometimes these subjects are second nature to us, and when I describe it, I have to take a step back and make sure I’m defining it correctly. J. DeWit: Because it is a little hard to grasp. I’m sure when you first gave this whole topic to me and said, “We’re going to sell this one this way, and this property that way”, and I’m sure I had to take a step back and go, “Why or what or how? Why not just flip them all and have a big bank balance? Don’t I want one hundred thousand dollars in the bank?” You would think that. But you don’t want one hundred thousand dollars in the bank staring at you. J. Butala: No, no, no. J. DeWit: You want 25 years of two thousand a month. That’s better! J. Butala: That’s a good point. You don’t want to have lots of cash. I mean, it’s counter intuitive- everybody wants to have a lot of cash, but you really need to be putting it … because when you know how to use it like we all do in this group, you want most of it working for you. J. DeWit: Exactly. You’re speaking to me personally there. I get hung up on that too in my personal world. J. DeWit: Thank you. I’m spending money as fast I can. J. Butala: You know what? You are the best … this is an accountant here, seriously. I have never met a woman in my life who is better with money than you. J. Butala: That’s from start to finish. J. DeWit: I’ve come a long way baby. Let me tell you! Oh boy, have I.
J. Butala: Your dad got the brunt end when you were a kid. J. DeWit: Yes. Oh yes. J. Butala: Well, don’t change a thing, Jill. J. Butala: Information and inspiration to buy undervalued property.